My tractor came with no fuse wired in. There's a switch for the rear light where the fuse holder is supposed to be. I would like to put a fuse in, but I don't know what wire it goes in. Also, I kind of like the light switch where it is, so I was thinking of using an inline blade type fuse. Can someone please chime in with what wire gets the fuse and any thoughts on an inline fuse. Thanks. Re: Wiring in a fuse. Check and see if the switch is wired to the main light switch there should be a fuse on the back of main light switch. If it is just make sure it is wired so it uses that fuse. butchs38 wrote: Check and see if the switch is wired to the main light switch there should be a fuse on the back of main light switch. If it is just make sure it is wired so it uses that fuse. I'll have to look when I get home. I think it's wired into the switch somehow. The rear light won't turn on unless the main switch is on. If thats the case then if there is a fuse on back of main switch then its fused. If your Cub has a Battery Ignition unit, being a 1951 Cub, it would have originally had the separate fuse holder in the bottom hole on the dash, and the 3 position light switch. The 4 position charge and light switch, used with the Cutout, or Relay, IH called it, charging system, had the fuse built on the rear of the switch. IH quit using that switch when the voltage regulator and Battery Ignition came out during 1950. 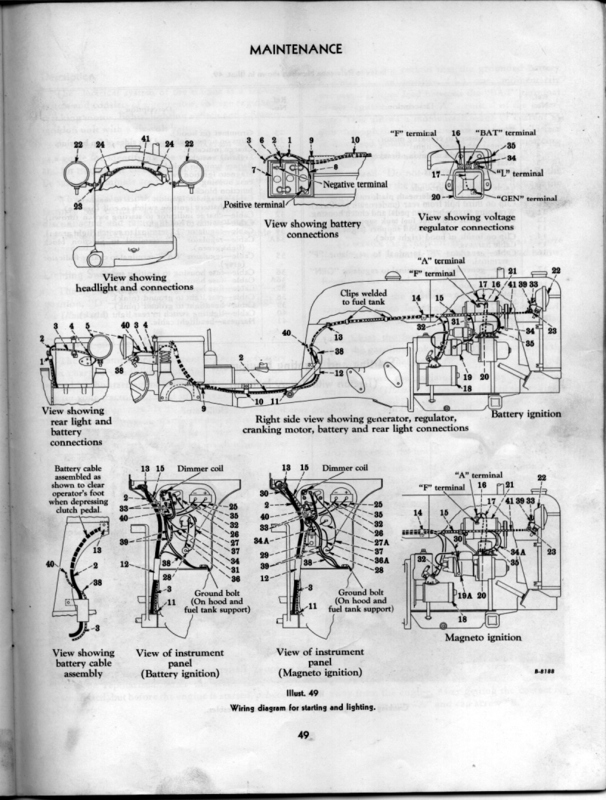 The Cub owner's manual has wiring diagrams showing how to wire the fuse holder that goes in the bottom hole on the dash. Below are pages from the late 1955 owner's manual, the numbers in the drawing on the 1st page are explained on the 2nd page. This is the original 6 volt wiring in the pics. It also shows the original battery to starter cable wiring, on the 1st page, if anyone is looking for that. It looks like the wire from the end of the fuse holder goes up to the light switch, and the wire on the side of the fuse holder goes to the always hot side of the ignition switch. TM Tractor has a new fuse holder, it says it's a Case IH part. I did know they changed to 3 position light switch but didnt know it was that early. My 50 has the 4 position I quess its an early 50. Yes, the Battery Ignition unit, voltage regulator, and 3 position light switch came out at Cub serial number 115403, Raymond Durban's database says. The 1952 Cub owner's manual shows the same 3 position light switch, and fuse holder as the manual that I posted above. I can't post the 1952 manual on here, the manual is at Quick links above, and it won't post here. The manuals I post are at Rudy's manuals, at the top of the page at Cub Info. Rudy's manuals does not have a 1952 owner's manual. There is a 1950 owner's manual there, showing the relay and 4 position switch, if you don't have the manual, butchs38. 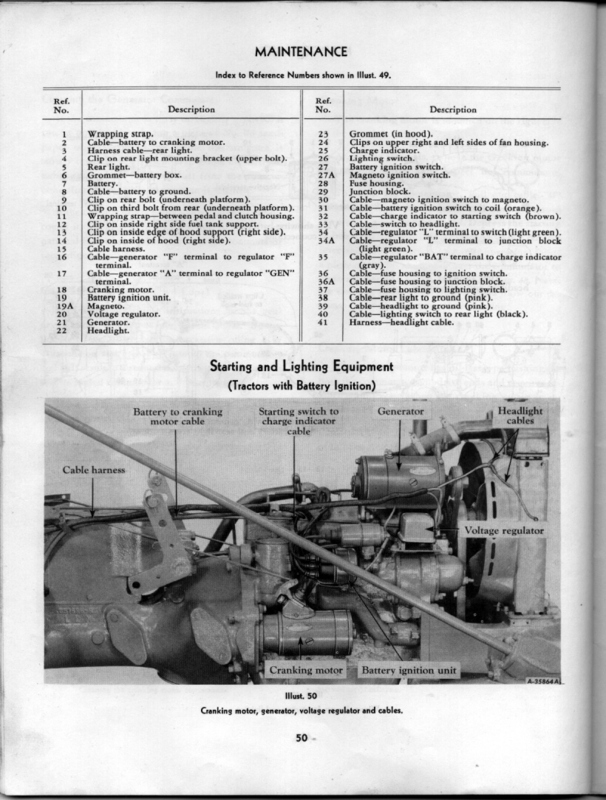 The owner's manuals have much info about operation, maintenance, and lubrication. Thanks I have a manual and its nice to know when the 3 position switch was used as my serial starts with 113 so I now know the switch is correct. Although it must have been converted to battery ignition. If you would like to add a blade fuse to the lighting circuit, find the wire that supplies power to the switch and splice in a blade fuse holder. I have a blade fuse holder and a fuse on a cigarette lighter socket. I use it to power a 12v sprayer. outdoors4evr wrote: If you would like to add a blade fuse to the lighting circuit, find the wire that supplies power to the switch and splice in a blade fuse holder. I have a blade fuse holder and a fuse on a cigarette lighter socket. I use it to power a 12v sprayer. That's what I did when rewiring my Cub. The original fuse holder had been removed and the wires to it spliced together. One of my changes when rewiring was to put in a blade fuse much like you did. I don't have a cigarette lighter socket, but I did wire in a dual USB charging port with digital voltmeter that was supposed to be for a motorcycle. butchs38 wrote: Thanks I have a manual and its nice to know when the 3 position switch was used as my serial starts with 113 so I now know the switch is correct. Although it must have been converted to battery ignition. The Battery Ignition unit, voltage regulator, and 3 position light switch came out at serial number 115403, like I wrote above. If your serial number begins with 113, it would have originally had the magneto, relay, and 4 position switch. IH did have Battery Ignition conversion packages years ago, to change Cubs to Battery Ignition. Below is the manual for that, it is for many models of IH tractors. The manual was made in 1950, it says on the last page. The last 2 pages on the list are newer. If your Cub has the voltage regulator shown in my post above, in the pic of the hood removed, and the 3 position switch, it may have had the package below installed. This is a package that had a voltage regulator, but it has a magneto also. The manual was made in 1951. There might have been a package for converting Cubs that already had the relay charging system to the newer voltage regulator, I don't know, it's not in the manuals group that I see. Maybe Jim B. knows if they made that. When switching to 12V do I need to swap the fuse?